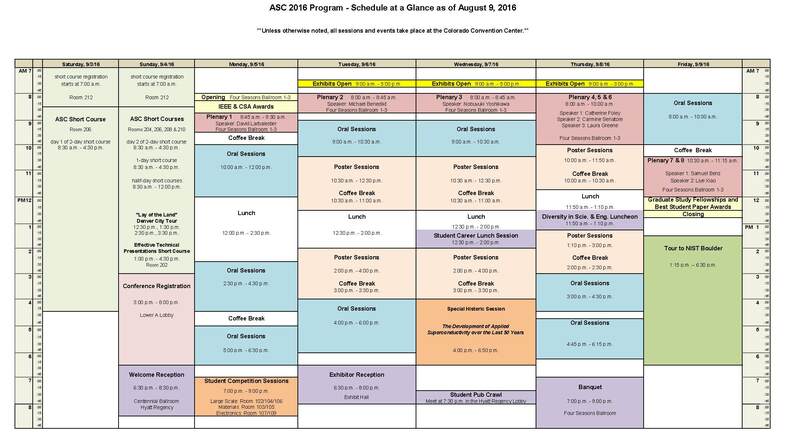 The ASC 2016 Conference Organizers occasionally need to make changes to the program. We urge you to check the schedule before and during the conference for last minute changes. Click on the Plenary Speaker names to view their short bios. Thu., Sept. 8 Catherine Foley (CSIRO) One HTS Josephson Junction – An Array of Applications: Has anything come from HTS devices in the last 30 years? Mon., Sept. 5 02:30 p.m. – 04:30 p.m. 1SPOr2A – What will Drive Market Maturity for HTS Applications in the Electric Power Sector? The first character of the program ID number represents the day of the Conference (Monday  thru Friday ). The second character (E, L, M, SP, PL) denotes the conference area (Electronics, Large Scale, Materials, Special Session, Plenary). Or or Po refer to an Oral or Poster session. 1, 2 or 3 represent the morning or afternoon time slots. A, B, C, etc., differentiate the oral sessions on a given day in the morning or afternoon time slot. The final digits denote the order within the session. Examples for a morning, afternoon and late afternoon sessions are 1EOr1A-01, 1EOr2A-01, and 1EOr3A-01; examples for a morning and afternoon poster sessions are 2EPo1A-01 and 2EPo2A-01. Poster Boards Numbering: 1 – 94 for Large Scale, 95 – 144 for Electronics and 145 – 193 for Large Materials. Each poster presentation has been assigned to a poster board number which has been added to the presentation ID, see the additional number in brackets. Examples are: 2EPo1B-04 , 3MPo2A-09 ; 4LPo1K-05 . Abstract session assignment notifications were sent to the corresponding and presenting authors on May 12, 2016. If you need to make changes to or withdraw your abstract, please send your request by email. Be sure to reference your abstract control number and your assigned program ID number. To access the detailed Technical & Conference Program / Itinerary Planner, please click here. Click on the image to open the Schedule at a Glance in PDF format.